I am loving all of the fun, extra codes that Kellogg's is giving me lately. I also love submitting my own codes from cereal boxes, cracker boxes, pop tart boxes and more! 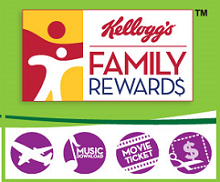 Well, if you collect these Kelloggs Family Rewards Codes then I wanted to let you know about a few new ones that are available. Here you go, expiration is unknown. Thanks! I love the fun codes too!